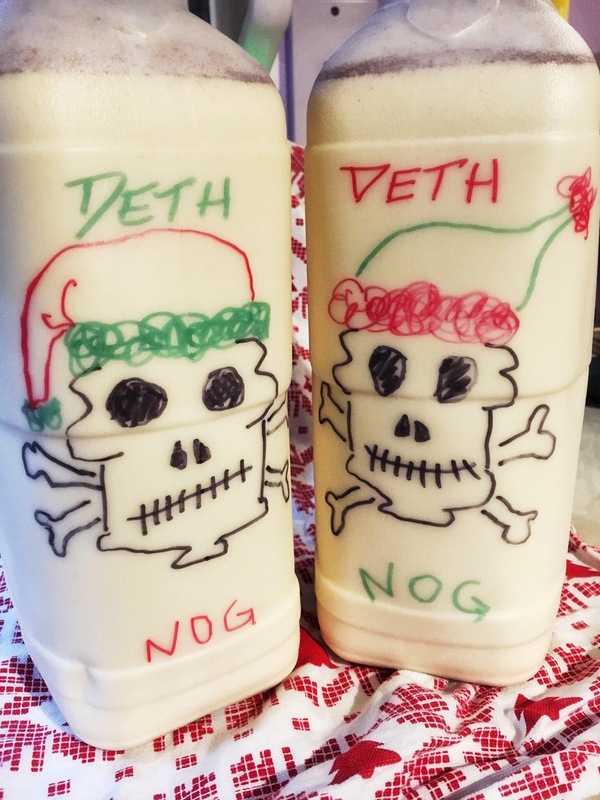 I have a good few amazing new blogger friends this year who have never heard about Deth Nog! Time to set that right. 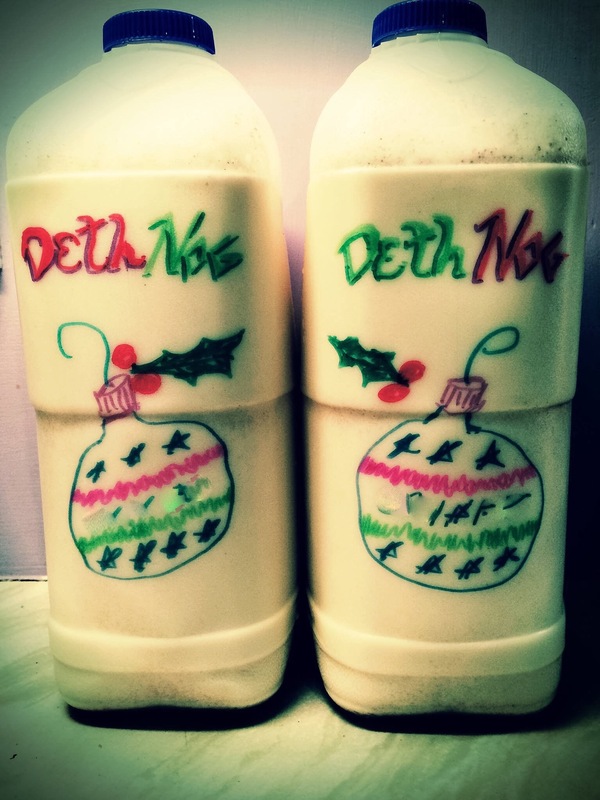 My dad always made (and hopefully still does make) some seriously potent home made egg nog for Christmas. Of course as kids, we were only allowed a sip or three, as it was heavily boozed up. We always bought milk in the typical big American gallon jug. Milk that was used for drinking, of course, and for everyone’s morning coffee (we kids had “coffee-milk” which was mostly milk with coffee splashed in – no concerns about caffeine being bad back then. And I’m glad. That drink was awesome, and it made us feel included in family rituals, and very grown-up). So. 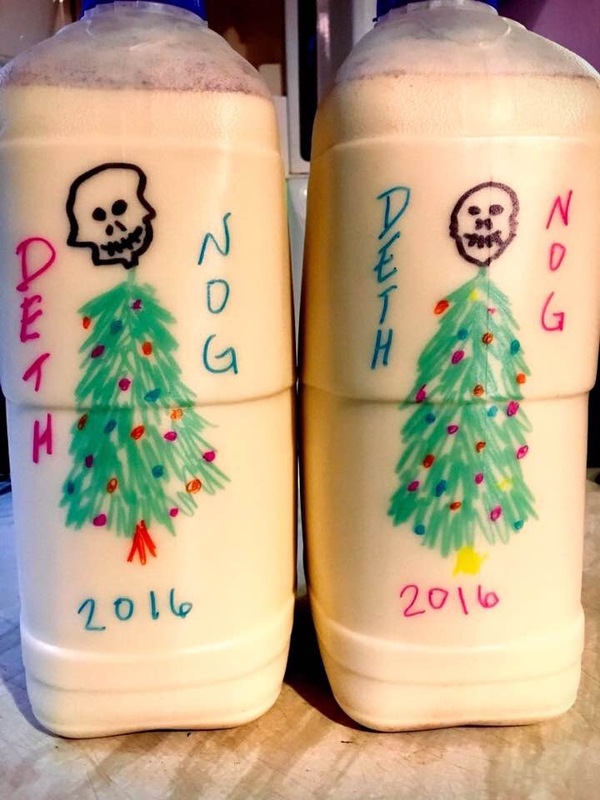 One year, mom blearily added the eggnog (made in an empty gallon milk jug) to her morning coffee. I’m sure she had a great day at work! We had a great new tradition- labelling the jug to prevent accidental morning tipples. Me being me, I’ve run with the idea over the years. Here are my efforts over the years I’ve been blogging. Definitely 2013. Maybe I made two batches. 2015. I think. Ah, who cares. 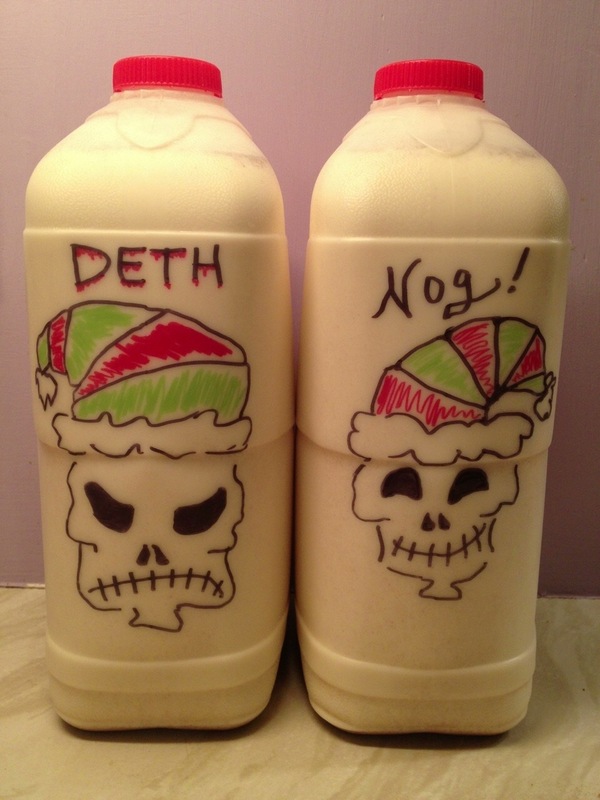 Freshly made tonight and finally labelled with the year so I don’t get mixed up again: crappy skulls on top of trees! Oh well, I tried. At least the trees look okay. It’s Sharpie marker – only one chance to draw. And now to the important part: how to pleasantly poison yourself and your family. US and EU measures both provided. Pour into empty jugs, try to put the same amount in each, oh how fun, and top up with milk until jugs are full. Note: I can’t find ‘not light and not dark’ rum here; I just use the white or clear rum. Please do let me know if you try it! It sounds fabuous! 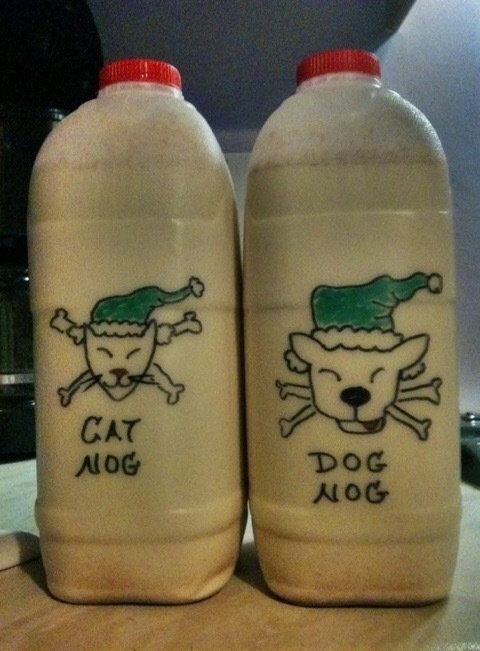 Do you think it would work with only bourbon and rum? Only I don’t want to buy brandy and whisky specially… And I have to halve your recipe as the two of us seriously won’t be able to get through that much lavish boozyness before the milk goes off! I know, I know, no stamina, but there you go. Yes, and yes and yes. We always manage but we share it with company and…well we drink too much in general. Actually with that massive amount of strong liquor, it doesn’t go off. I can’t eat undercooked Irish eggs (I have IBS and they just don’t like me) but I can drink these raw ones with no problem. Could you use artificial sweetener? Or is it all the sugars in the milk and cream? Well, it isn’t cheap to make either! You know, I had the first of it last night. It IS too much like a dessert. Sorry hon! How clever. I’d love to do this, but I’m too lazy. 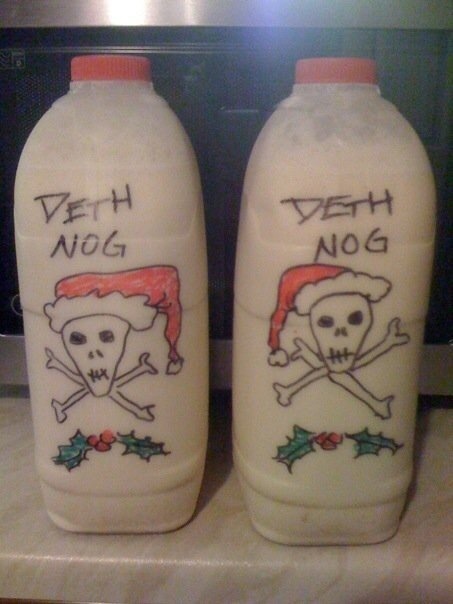 I’m sure yours tastes better than the jugs I buy in the store and dose with a wallop of booze and nutmeg. 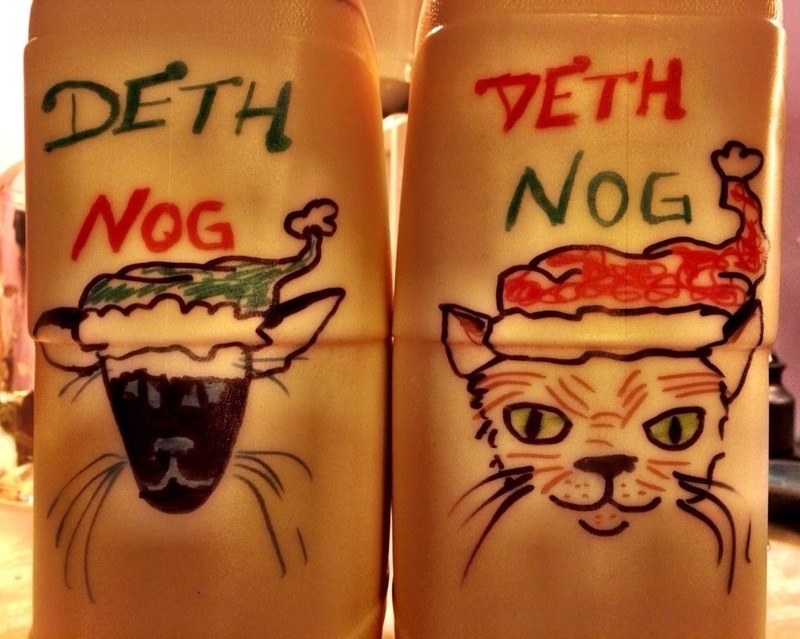 Your labels make it a true Christmas Tradition. Maybe I’ll just draw labels on the grocery-store mug. Merry Christmas. Enjoy! Wishing you all a very Happy Christmas and all good wishes for 2017! I think you should sell the fabulous illiustrated containers – maybe with recipe. Awww, thank you! Both for the kind words about my rushed drawings, and the Christmas Eve Gift wishes. My gift tonight is going out to the pub to see a good friend who surprised us by flying home yesterday for his first Christmas home in over a decade. Wishing you and yours a glorious Christmas and a fantastic New Year.